The Sony NEX-7 has been out for quite a while now, but it still sits atop the NEX line of mirrorless Compact System Cameras in the flagship position. It features a 24 megapixel APS-C sensor in a very tiny body, and for many people was somewhat of a ‘holy grail’ camera when it was released last year. This is the first NEX body I’ve had a real chance to put through the paces, and my friends at LensRentals.com were kind enough to loan me an NEX-7 body and the Zeiss 24mm f/1.8 for review. I also purchased a Konica AR to NEX adapter so I could use a few of my Hexanon lenses, with a particular eye towards my 57mm f/1.2, which would make an ideal portrait lens for the NEX-7. If you’re not familiar with my reviews, I review from a real world shooting perspective. You won’t find lens charts or resolution numbers here. There are plenty of other sites that cover those. I review products on how they act for me as a photographic tool. 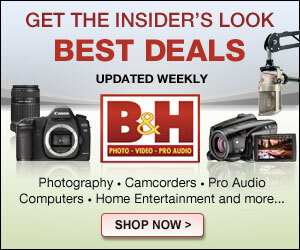 Also, I would like to thank my friends at LensRentals.com for providing the camera and lens for this review. Please visit them whenever you need a lens for that once in a lifetime shoot, or just if you want to try a lens out without having to buy it first. Sony NEX-7 Front, with Pop-up flash raised. The NEX-7 is a small camera, though the largest of the NEX bodies. It is basically a rectangle with a lens mount and a protruding grip. The design of the camera is starkly minimalist, which you will either really like or find boring. The grip is large and chunky, and contains the shutter release, power switch and one of the function buttons that can be reassigned. The top of the camera features the two large programmable dials, primarily used for changing shutter speed and aperture, as well as the NEX-7’s proprietary hot shoe and the pop-up flash. The rear of the camera has two buttons that operate on-screen items, and the menu dial with a four way switch and center button. The video record button sits to the upper right. An interesting item on the rear is the switchable button, which allows you to switch functions between AutoExposure Lock and a manual focus toggle. To the left of this is the image review button and the pop up flash release. Sitting in the upper left corner is the NEX-7’s electronic viewfinder. This is a high resolution 2.4 million dot EVF that adds no bulk to the camera, save for the small protrusion of the eyecup. The rear screen is a 3″ 16:9 aspect ratio monitor that tilts up or down in nearly the exact same way as the Olympus OM-D E-M5’s screen does. The 16:9 aspect ratio is well used, as during still capture, the 3:2 aspect ratio image from the sensor is displayed shoved to the left, while a display of the current functions of the rear controls is put to fill the remaining space on the right. It works well, and makes good use of the space. The camera is very well built, with a solid magnesium alloy body and tight tolerances. It feels reassuringly solid in the hand. The squared off grip is wonderful for many people, but, at least in my hands, I found it uncomfortable in practice. No matter what grip I tried, it either felt too thick or oddly shaped. My fingers felt crammed into the space between the grip and the lens mount, and the lack of curvature on the grip was uncomfortable. I would have much preferred if Sony had taken a little width out and rounded the grip off a little more. It would have added considerably to the comfort of the camera in use. All the dials and buttons are easily accessible, though the video record button is placed in a manner a little too easy to bump. However, a recent firmware update has allowed the user to lock that button to prevent accidental pressing. When I first started using the camera, I found myself changing the ISO accidentally, as I had set it to be on the rear control wheel. The rear wheel spins VERY easily, and it was far too easy to bump. Luckily that front button next to the shutter release allows one to lock the rear controls if desired. I did so, and assigned the ISO control to the right point on the four way controller, allowing for much less accidental changing of those settings. The NEX-7’s viewfinder position is a mixed bag. I loved the upper left positioning when shooting in landscape orientation, as it avoided the ‘nose on screen’ smearing that can happen with other cameras, but in portrait orientation, I found it awkward, as it sits too low on the camera. I also noticed that in either orientation, it doesn’t allow you to stabilize the camera against your face as well as your typical DSLR or CSC with a more centered viewfinder, as the camera tends to pivot around that contact point. As I mentioned before, the NEX-7 is a small camera, but it’s not too small. 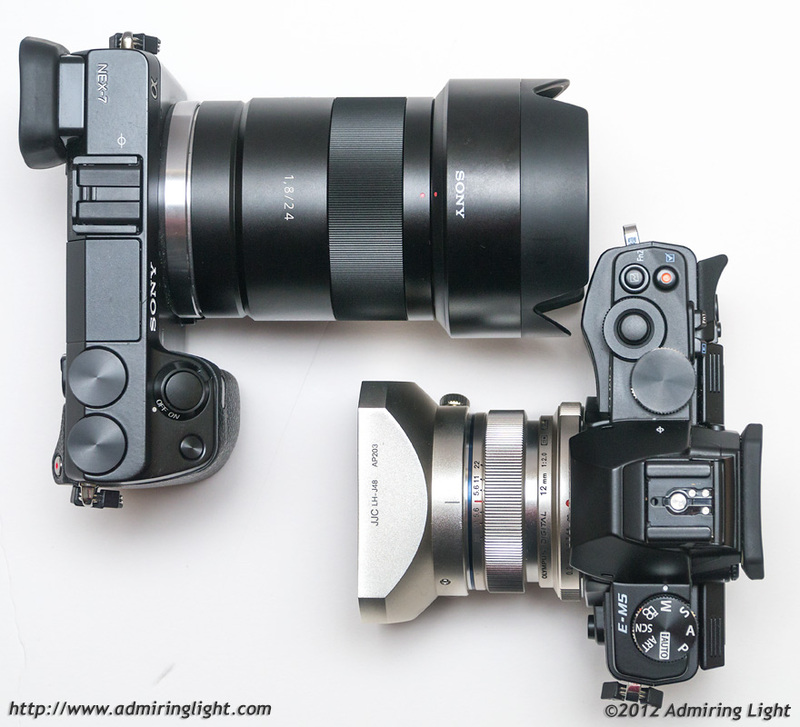 It’s roughly the same footprint as the Olympus OM-D E-M5, as seen above, though the Olympus is taller due to the hump containing the EVF and Image stabilization sensors. The NEX manages to cram it’s EVF into the main body of the camera, keeping a lower profile. I think the NEX manages a very nice balance of size and ergonomics, and think the body is well sized. 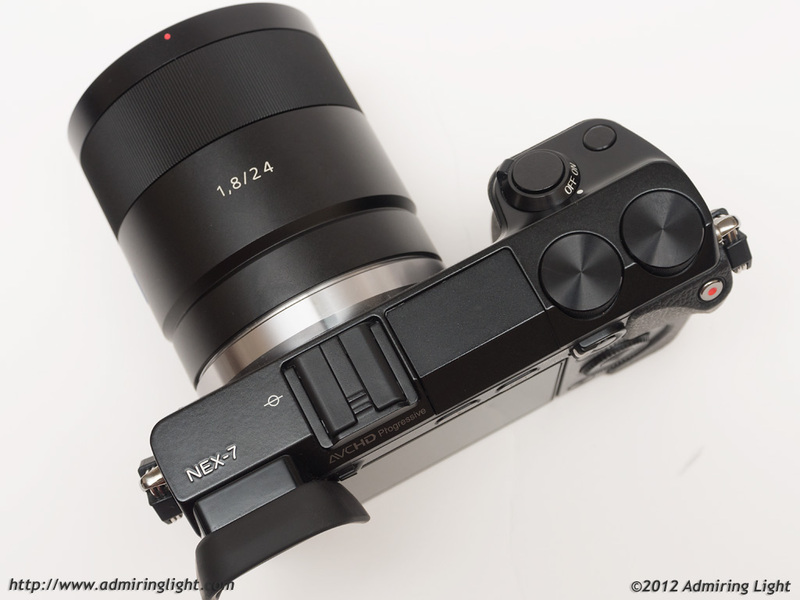 Unfortunately, the lenses for the NEX system tend to be a bit larger than those on Micro 4/3, and the Zeiss 24mm f/1.8 is one of the worst offenders. Despite both lenses above being wide-angle lenses with similar apertures, there is a big difference in lens size, as can be seen below. The overall NEX package here, though, is still relatively compact and surprisingly lightweight, but compared to Micro 4/3, you’re probably going to be carrying a larger bag. In case you haven’t seen this, it’s possible to have ugly but functional focus peaking on E-M5 too. Just put art filter 11 to a Myset and set Fn1 to activate it. Just did this a couple of days ago. Works like a charm! – I’ve not seen the AF switching behaviour in low light that you mention. I’ve just tried single and flexible spot AF on the 18-55mm kit lens and the Sigma 19mm/2.8 in low light (about EV2) and it stays single point and does not switch area AF. Which firmware version were you using? My tests were done with v1.01. Did you have the AF assist light turned on? – The look of the EVF is controlled by the Creative Styles settings. To lift the blacks and decrease contrast, you can change it to Portrait style and -3 contrast giving a flatter preview. – I’ve been using cheap adapters from the iISO to ISO flash mount for years. I have no problems with using conventional flash accessories (radio triggers etc.). Amazon or eBay have these for just a few bucks, it’s easy to get several and have one in every camera bag. Personally, the iISO flash mount is mechanically superior to the ISO hotshoe, quick and easy to mount and dismount, one-handed operation, positive locking without having to turn any levers or turn screws, and push-button unlocking. It’s a shame other manufacturers are still relying on a mechanical “solution” little different from the 1913 Ur-Leica. Herbert Keppler wrote an article about the flash show http://keppler.popphoto.com/blog/2007/01/shoe_fetish.html which has a bit of history of the flash shoe. 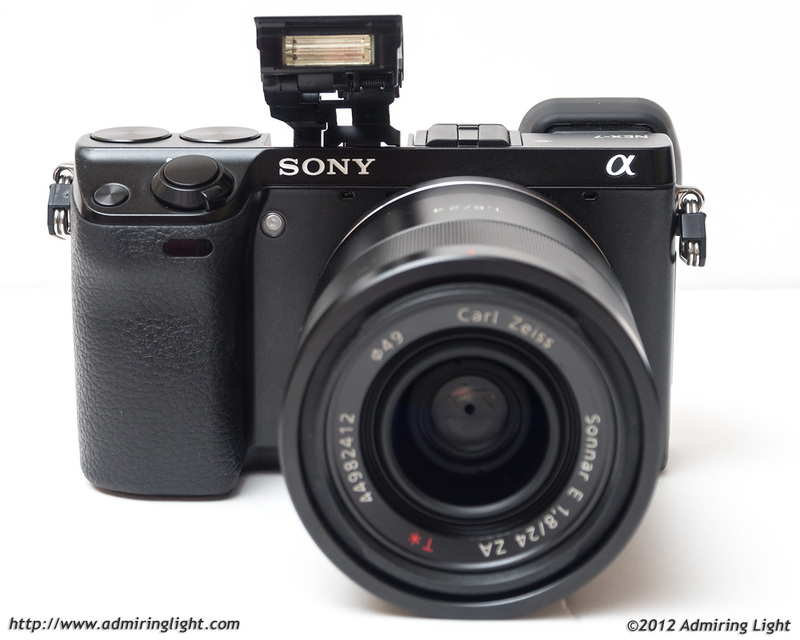 – I love the grip of the NEX-7. I find it secure and adaptable in hold, especially when used one handed (I use it in all sorts of positions when doing candid/street photography). This is of course an individual preference, I have medium-small hands but I have no problems with the grip of a D300 either. – If you’re left eyed, then the position of the EVF allows either the nose (landscape) or forehead (portrait with grip up) to brace the camera. The NEX-7 isn’t perfect (AF could be improved, low light a little less noisy, menus could be streamlined, at least they fixed the video button in the latest firmware) but I think it’d does enough things well to make it a great photographic tool. For me, it does double duty as a landscape camera (the dynamic range is simply invaluable here) and as a street shooter (the small unimposing size and focus peaking is great). Thanks for your thoughts. My feeling on the grip is, of course, personal preference. It just never felt right to me. However, it appears from further research that this doesn’t occur when the AF assist light is off. As I don’t generally turn this feature off in any in my cameras, I didn’t do it here. I have updated the review accordingly. While the hotshoe may be a good design, using an adapter is a kludgy solution, and nearly every flashgun made since about 1970, and many even before that, use the standard ISO hotshoe, so it would still be my preference to have that. 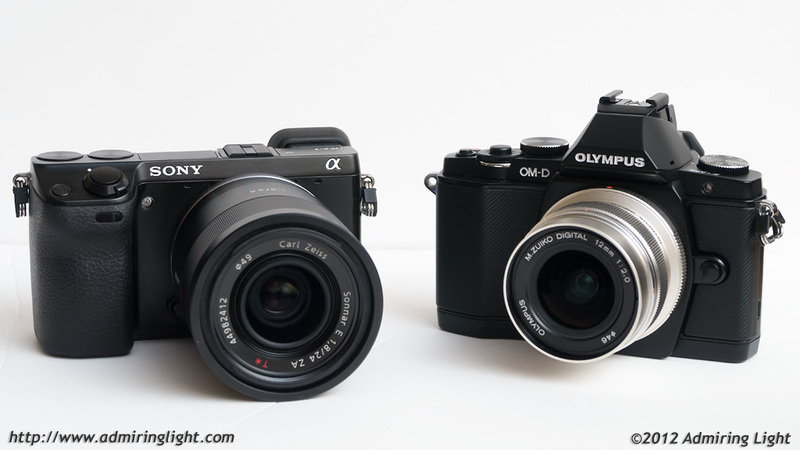 Sony seems to agree, since with the NEX-6, they’ve switched. I did lower the contrast for the EVF. It’s a good EVF, and is the best I’ve used in some respects, and not as good in others. I’ll second the observation that without the AF light on there is no switchover in the AF under low light. As a photographer interested in a quick, unobtrusive camera, I was interested in the NEX-7 when it came out but initially turned off by the aggressive pricing and lack of lenses. I was shooting M4/3 at the time, which had lenses but in 12MP incarnation, the files were marginally good at lower light and lacked dynamic range, badly. I know the 16MP version is better, and the GX1 was pretty good, but I won’t work well with clip on viewfinders. I picked up a used NEX-7 and a kit lens and a Sigma 30/2.8 for probably the same price as a OM-D body. My main worry was whether the AF was good enough, as I had seen some harping on that from reviewers. I also read how the menu system was a mess and all about the video button. With a bit of surprise, I found the NEX-7 to be quite quick, certainly fast enough to shoot candids, and a real ergonomic pleasure. You can program it to have every essential, and some non-essential functions at your fingertips, so menu diving is almost never necessary. The EVF is excellent, as the previous commenter mentioned, once you reduce contrast. I can’t think of a camera that lets me adjust exposure, F stop, shutter, ISO, focus mode, etc., without taking my eye away from the VF unless you go to high-end DSLR’s. Focus peaking is nice, but another surprise is how effectively it can be set up to check AF focus and override it. You can set the AF/MF button to trigger MF, focus with AF and by touching slighly the focus ring have instant magnification and override. Tapping the shutter button brings back the original VF view. It’s very fast and intuitive. Finally, small point that those of us who do a lot of street shooting will appreciate. You can turn off the LCD and operate with only the EVF. The Panasonic GF1 let you do that, the GX1 did not. For less conspicuous nightime shooting, it’s a real bonus. As far as IQ goes, the sensor is just about as good as it gets. People have disparaged the kit lens, which you can get ridiculously cheaply for about $150 (in beautiful black), but miss a bit of the point. The NEX fixes the CA and distortion pretty well by software (I can’t find any when looking at files in Aperture), and whether or not resolution is ideal (it may not be any better or worse than other kit lenses), all the sensor’s DR goodness is fully resolved by the kit lens. It is simply a nicer file than anything I’ve ever seen from a M4/3. All in all, a real winner. Thank you for the review Jordan. I was particularly interested how well your Konica 57 f/1.2 lens worked with the camera, as I have that lens and consider it the best lens of all time. After reading your review I’m holding off and waiting for the full frame version. Hopefully by then they will have the auto-focus improved. I expect we will get even better use out of old legacy glass on the full frame version. How is the EVF when shooting at night? My current G1’s EVF is fine in low light but in very low light and nightime the EVF kicks out a lot of light and acts like a torch shining directly into my eye. It’s so uncomfortable that I can’t use it for more than a few shots, plus the EVF blacks out in very low light and fails to displays things that can be seen by eye. If Jordan or anyone has anyone used a Nex 7 or 6 for nightime shooting I’d appreciate any thoughts on these two points as if I go for one of these I’ll probably have to buy it online.. Please. Let me know in what settings to photograph, to get clear photographs in low light, using next with the kit lense.